A South San Francisco police officer was back on duty Monday for the first time in more than a year after a suspect hit him in the head with a skateboard on Thanksgiving Day in 2016, police said. 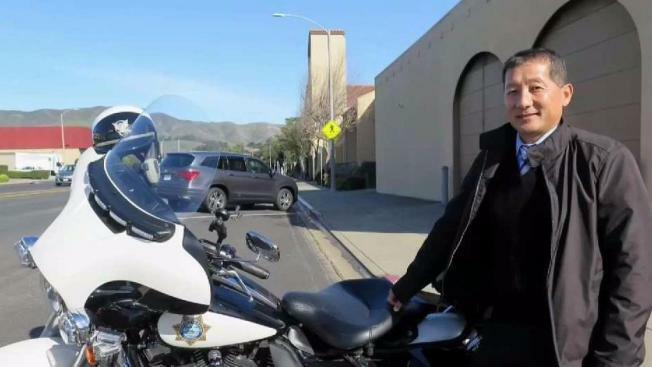 Motorcycle Officer Robby Chon returned to light duty status after an attack the left him with a skull fracture and bleeding that required brain surgery. "Our hero has returned!!!" South San Francisco police wrote on Facebook. Chon responded to a disturbance Thanksgiving Day 2016 after someone called to report that a man was acting irate toward customers at a business in the 300 block of Grand Avenue. Some officers who responded tried to approach 28-year-old Luis Ramos-Coreas who allegedly made the disturbance, but he refused to obey officers and rode off on a skateboard as other officers arrived. Chon chased after him and Ramos-Coreas allegedly stopped, turned and hit Chon in the head with the skateboard. Ramos-Coreas started running after the attack but other officers were able to stop him, according to police. Ramos-Coreas is scheduled to appear in San Mateo County Superior Court April 2 for the start of a jury trial, San Mateo County prosecutors said. Chon lost consciousness after the assault. "With the support of family, friends and the community, Robby fought back through a year of multiple surgeries and hours upon hours of rehabilitation in his desire to return to duty to serve out citizens," police said in the Facebook post. "Robby's tenacity and determination to overcome the odds defines what it means to be a hero in blue."